Locknetics by Schlage M490G Gate Lock is weather resistant and designed for use on all types of exterior sliding and swinging gates. 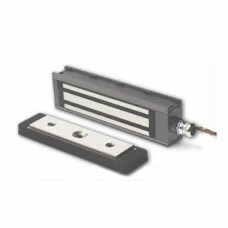 The M490G Gate Lock is a weather resistant electromagnetic lock with 1500 lbs. of holding force. As a high security magnetic lock it can accommodate misalignment problems while supplying superior holding force. A 1/2˝ compression connector is provided for installation of 1/2˝ EMT conduit, insuring protection of hook-up wiring from weather and vandalism. Heavy duty plating resists corrosion of mating surfaces providing a low maintenance locking device. A modified Top Jamb mounting bracket allows a single Model M490G to be mounted in a variety of positions. The M490G Gate Lock may be mounted to any gate frame or post. Special brackets may be required to adapt the lock to a particular frame or post. It is important that the lock is mounted so that the armature pulls straight back from the magnet face. The M490G can be field configured for either 12 or 24 VDC operation. A lock status switch (MBS) and gate status switch (DSM) are standard. Holding Force Meets or exceeds BHMA standard of 1500 lbs.